Water Garden Do It Yourself! 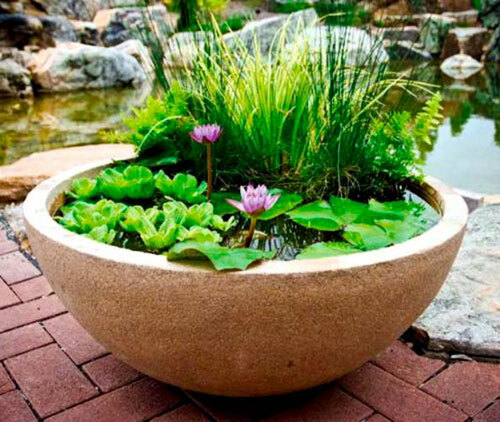 Every garden is an oasis, and even a modest water feature can add a sense of coolness and calm. Fortunately, there's no elaborate hardscaping required to try out a water garden in your yard. You can easily make a pool into a pot out of a glazed high fired planter! Select a large glazed high fired container at least 30" in diameter without a drain hole preferably. However, many pots are only available with drains so plug them with silicone. This large of a pot is heavy and once it's filled with water you will not be able to move it so place it in its permanent location first. For plant materials, choose a single dwarf water lily, or plants such as canna, Lobelia, and soft rush. Arrange the plants in the container, placing the largest in the center or at the back. 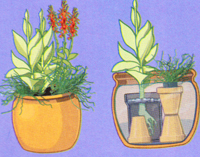 To raise plants in smaller pots, set their pots atop overturned empty pots as pictured. Check that the main container is level, then fill it with water. Most aquatic plants do best with 1" or more water over their crowns. For mosquito control, add mosquito fish or goldfish. a 30" container can accommodate size fish. Acclimate the fish by placing them, still in the plastic bags, in the tub garden for about 20 minutes. Or add a mosquito control ring, available at most nurseries. Now how hard was that! Read more.....In a country room. Read more.....Easy ways to vertical garden.